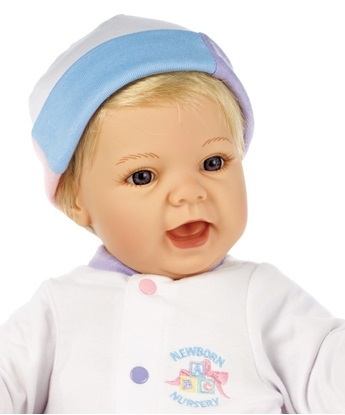 Created for Judy's Dolls, we are pleased to introduce Magic Baby, a huggable, loveable baby doll. These babies are weighted to feel similiar to a real newborn baby, with a cloth body and soft vinyl head, arms, and legs. This Magic Baby has red rooted hair and green eyes. Made in Spain and surprisingly lifelike, this baby can be a boy or a girl and has a light skin tone. This baby is perfect for ages 3 and up. Here, Magic Baby is dressed in a white onesie with the Judy's Dolls heart logo on the chest and a matching cap.